The Pacific is a 2010 American television series produced by HBO, Playtone, and DreamWorks that premiered in the United States on March 14, 2010. The series is a companion piece to the 2001 miniseries Band of Brothers and focuses on the United States Marine Corps' actions in the Pacific Theater of Operations within the wider Pacific War. Whereas Band of Brothers followed the men of Easy Company of the 506th Parachute Infantry Regiment through the European Theater, The Pacific centers on the experiences of three Marines (Robert Leckie, Eugene Sledge, and John Basilone) who were all in different regiments (1st, 5th, and 7th, respectively) of the 1st Marine Division. The Pacific miniseries features the 1st Marine Division's battles in the Pacific, such as Guadalcanal, Cape Gloucester, Peleliu, and Okinawa, as well as Basilone's involvement in the Battle of Iwo Jima. It is based primarily on the memoirs of two U.S. Marines: With the Old Breed: At Peleliu and Okinawa by Eugene Sledge and Helmet for My Pillow by Robert Leckie. It also draws on Sledge's memoir China Marine and Red Blood, Black Sand, the memoir of Chuck Tatum, a Marine who fought alongside Basilone on Iwo Jima. Robert Leckie and the 1st Marines land on Guadalcanal and take part in the Battle of the Tenaru. Eugene Sledge persuades his parents to allow him to join the war. The Battle of Savo Island is briefly portrayed. John Basilone and the 7th Marines land on Guadalcanal to bolster the defenses around Henderson Field. Basilone, attempting to relocate his machine gun to a better position, bare-handedly cradles the hot barrel while in action, severely burning his arms, and continues fighting. The 1st Marine Division on Guadalcanal is relieved and arrives in Melbourne, Australia. Leckie falls in love with Stella Karamanlis, an Australian girl of Greek descent, who invites him to stay at her parents' home. Basilone receives the Medal of Honor and is sent home to sell war bonds. Eugene Sledge enlists in the Marines and trains for combat, while Leckie and the 1st Marine Division are put into action at Cape Gloucester. After their action on Cape Gloucester, Leckie and 1st Marine Division arrive in Pavuvu, which serves as temporary home to the U.S. 1st Marine Division. Leckie is treated for nocturnal enuresis caused by combat stress. Sledge is reunited with an old friend, Sidney Phillips. Leckie integrates himself back into the front-line lifestyle. Sledge and Leckie land with the 1st Marine Division at Peleliu. The Marines move to capture Peleliu's vital airfield. Leckie is wounded by a blast concussion during the battle while trying to relay a message to the corpsman. With a face full of shrapnel and limited mobility, he is evacuated and sent to recuperate on a hospital ship as the fighting continues. Sledge and the 5th Marines move into Peleliu's Bloody Nose Ridge to face the Japanese. Andrew “Ack-Ack” Haldane is shot and killed by a Japanese sniper while assessing the area of Hill 140. Basilone is transferred to the 5th Marine Division where he trains Marines for combat. There he meets and marries Lena Riggi. He then lands at Iwo Jima but is killed by Japanese small arms fire. Sledge and the 1st Marine Division land at Okinawa. Sledge, now a seasoned veteran, becomes more cynical and no longer shows any compassion for the Japanese. As he and others prepare to return home from Okinawa, they hear of a "new bomb" that "vaporized an entire [Japanese] city in the blink of an eye". Sledge and Leckie return home after the Japanese surrender. Sledge is still haunted by the horrors of war. Leckie starts a relationship with Vera. Basilone's widow, Lena, visits his parents and gives them his Medal of Honor. 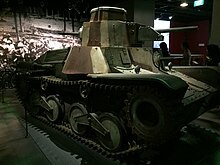 Replica Type 95 Ha-Go light tank in the National Museum of Singapore, one of four constructed for the miniseries. The Pacific was produced by Steven Spielberg, Tom Hanks, and Gary Goetzman in association with HBO Miniseries, Playtone, DreamWorks, Seven Network and Sky Movies. Seven and Sky both invested in the project for the right to broadcast it in Australia and the United Kingdom respectively. Nine Network has previously broadcast the HBO productions of Band of Brothers. Nine had a broadcast deal with HBO's parent Warner Bros., but then HBO started to distribute its own productions separately. In April 2007, the producers set up a production office in Melbourne and began casting. Originally the project was estimated at $100 million to produce, but ended up costing over $200 million, making The Pacific the most expensive television miniseries ever created by any network. According to The Sydney Morning Herald the series cost $270 million, with an estimated A$134 million of that spent in Australia. The Australian newspaper Herald Sun estimates that it brought 4,000 jobs and generated A$180 million for the Australian economy. Filming of the miniseries in Australia started on August 10, 2007, and finished in late May 2008. From August until November 2007 filming took place at locations in and around Port Douglas, Queensland including Mossman, Queensland; Drumsara Plantation, Mowbray National Park and beaches at Rocky Point, Queensland. Production then moved to rural Victoria, in the You Yangs near Lara (from November–December 2007), then at a sand quarry on Sandy Creek Road near Geelong, Victoria until February 2008. Melbourne city locations were used in late 2007 and through 2008 including Central City Studios at Melbourne Docklands (March 2008); Flinders Street (between Swanston and Elizabeth streets, 1–4 February 2008); the intersection of Swanston and Flinders streets (February 2008); Flinders Street station (2–3 February 2008). Other suburban locations included Mornington Railway, Bundoora, Victoria, specifically the Ernest Jones Hall at the La Trobe University campus, Bundoora (late May 2008); the Railway Hotel, South Melbourne (December 2007); Scotch College, Melbourne (December 2007); Melbourne High School (December 2007). The series' score was written by Hans Zimmer, Geoff Zanelli and Blake Neely and was released on March 9, 2010. Historian Hugh Ambrose, son of Band of Brothers author Stephen E. Ambrose, wrote the official tie-in book to the miniseries, which follows the stories of two of the featured men from the miniseries, Basilone and Sledge, as well as stories of Sledge's close friend Sidney Phillips and two men not featured in the series, marine officer Austin Shofner and U.S. Navy pilot Vernon Micheel. The different cast provides a wider view of the Pacific theatre, allowing the book to include the fall of the Philippines, Midway, Philippine Sea and Luzon and expand the narrative to include depictions of life as experienced by prisoners of war, senior officers and the development of naval aviation. It was published in the UK and the U.S. in March 2010 and Ambrose gave a webcast interview about the book at the Pritzker Military Library on April 15, 2010. The series premiered in the US and Canada on March 14, 2010, on HBO. HBO Asia premiered The Pacific at 9 pm on April 3, 2010, with the first two episodes being consecutively broadcast in the first week. Singapore, Hong Kong, and Indonesia had dual language available. Singapore, Hong Kong, Taiwan, Malaysia, and Philippines broadcasts were available in high-definition on the HBO Asia HD Channel. The Pacific began broadcast on April 5, 2010 on Sky Movies in the United Kingdom and Ireland. In Portugal, the series was broadcast on April 5, 2010 on AXN and in HD on AXN HD two days after the original broadcast in the U.S. The series broadcast commenced in Australia on Channel 7 on Wednesday, April 14, 2010, at 8:30 pm. In Denmark, Norway, Finland, France and Sweden, the series began broadcasting on Canal+; in Turkey, CNBC-e on 18 April 2010; in the Netherlands, on April 7, 2010 on Veronica; and in Greece, on Nova Cinema on April 10, 2010. In New Zealand, the series began broadcasting on April 12, 2010 on TV One. In Italy, the miniseries began broadcast on May 9, 2010 on Sky Cinema 1; in Germany, on July 15, 2010 on Kabel eins. In Japan, the miniseries started July 18, 2010 on WOWOW. In South Africa, the miniseries started broadcasting on May 5, 2010 on the Mnet channel. The first official U.S. trailer for The Pacific aired on HBO prior to the season 2 premiere of True Blood on June 14, 2009. It showed footage of the three main characters, including a conversation between Leckie and Sledge, Basilone's marriage and numerous combat scenes. The trailer concluded with "2010" displayed on-screen -alluding to and confirming the series release date. A second trailer was released on the HBO website after which the date "March 2010" is displayed, giving a more specific series release date. On January 14, 2010, Comcast added on-demand content from the series, including a scene from The Pacific, interviews with the producers and character profiles. Another trailer was shown in February 2010 during Super Bowl XLIV, depicting several combat scenes. An extended trailer (3:47) to the miniseries can be viewed on the series' official website. The Pacific was very well received by critics. On the review aggregation website Rotten Tomatoes, the series holds an approval rating of 91% with an average rating of 8.32 out of 10, based on 43 reviews. The website's critical consensus reads, "An honest, albeit horrifying, exploration of World War II, The Pacific is a visually stunning miniseries not for the faint of heart." On Metacritic, the series has a weighted average score of 86 out of 100, based on 32 critics, indicating "universal acclaim". Time magazine's James Poniewozik named it one of the Top 10 TV Series of 2010. IGN reviewer Ramsey Isler gave the entire miniseries an 8.5 out of 10, saying "Although I don't think The Pacific overtakes Band of Brothers in terms of technical execution and overall entertainment value, many of the comparisons will be moot as The Pacific is a different kind of series with different goals. This series sought to look beyond the combat and it paints a full, vivid picture of the war and the people that fought it through focused, individual stories. That's a tall order for any series to fulfill, and although The Pacific doesn't always come through with shining colors, it does make an admirable effort." IGN also reviewed each individual episode, with Episode 9 receiving a perfect 10 out of 10 score. The Pacific won a Peabody Award in 2010 for "reminding us of the necessities—and the costs—of service." It also won the Primetime Emmy Award for Outstanding Miniseries and was nominated for the Golden Globe Award for Best Miniseries or Television Film. Andrw Ramage, Michael Minkler, Daniel J. Leahy, Craig Mann "Peleliu Landing"
Gary Wilkins, Michael Minkler, Daniel J. Leahy, Marc FIshman "Iwo Jima"
Gary Wilkins, Michael Minkler, Daniel J. Leahy "Okinawa"
^ Schneider, Michael (15 August 2007). "More directors take 'Pacific' plunge". Variety. Retrieved 1 February 2008. ^ Stanhope, Kate (16 December 2009). "HBO to Premiere The Pacific 14 March". TVGuide.com. Retrieved 3 April 2010. ^ Zeitchik, Steven (24 April 2007). "HBO greenlights Spielberg mini". Variety. Retrieved 3 April 2010. ^ "About the Series". HBO. Retrieved 10 December 2010. ^ "Red Blood Black Sand". MarinesWWII.com. Retrieved 10 December 2010. ^ Gilbert, Lori (14 March 2010). "Stockton man's Iwo Jima experience part of HBO miniseries". The Record. Retrieved 3 April 2010. ^ Patterson, Michael Robert (27 January 2007). "Andrew A. Haldane". arlingtoncemetery.net. Retrieved 10 December 2010. ^ Seidman, Robert (16 March 2010). "Kamikaze! HBO's Big Budget The Pacific Premiere Ratings Disappoint". TV by the Numbers. Archived from the original on 23 March 2010. Retrieved 29 March 2010. ^ Seidman, Robert (23 March 2010). "Nielsen Ratings for HBO's "The Pacific" Down, But Not Much For Second Episode". TV by the Numbers. Archived from the original on 29 March 2010. Retrieved 29 March 2010. ^ Seidman, Robert (31 March 2010). "Ratings for HBO's "The Pacific" Steady". TV by the Numbers. Archived from the original on 3 April 2010. Retrieved 2 April 2010. ^ Seidman, Robert (6 April 2010). "Ratings for HBO's "The Pacific" Down On Easter Sunday". TV by the Numbers. Retrieved 6 April 2010. ^ Berman, Marc (14 April 2010). "The Pacific Ratings". Mediaweek. Archived from the original on 18 April 2010. Retrieved 2 July 2015. ^ "Cable TV Ratings for Week Ending April 18, 2010" (PDF). TV Aholics. 25 May 2010. Retrieved 2 July 2015. ^ "Cable TV Ratings for Week Ending April 25, 2010" (PDF). TV Aholics. 25 May 2010. Retrieved 2 July 2015. ^ Seidman, Robert (4 May 2010). "Oy "Treme," "The Pacific" + "Army Wives" & Other Sunday Cable". TV by the Numbers. Retrieved 2 July 2015. ^ Seidman, Robert (11 May 2010). "Sunday Cable: NBA, "Army Wives" Tops With 18-49; "The Pacific" Dives Below 2 Million". TV by the Numbers. Retrieved 2 July 2015. ^ "Cable TV Ratings for Week Ending May 16, 2010" (PDF). TV Aholics. 25 May 2010. Retrieved 2 July 2015. ^ "Channel Seven Lands Spielberg". News.com.au. 16 May 2007. ^ Reynolds, Simon. "Sky responds to 'Pacific' airing criticisms". Digital Spy. Hearst Magazines UK. Retrieved 10 January 2016. ^ Ziffer, Daniel (16 May 2007). "Spielberg miniseries forms link with Seven". The Age. Australia. Retrieved 3 April 2010. ^ a b Bodey, Michael (16 May 2007). "Seven trumps Nine by landing war miniseries". The Australian. News.com.au. Retrieved 3 April 2010. ^ Browne, Rachel (8 April 2007). "Australia Poised to Score $150m Deal for Epic War Series". The Sun-Herald. ^ Dunn, Emily; Maddox, Garry (3 December 2008). "Stay in Touch: Thanks Hanks". The Sydney Morning Herald. Retrieved 3 April 2010. ^ "Movies on a Roll". Herald Sun. Australia. 3 August 2008. ^ "First Shots in War Epic". mX. 10 August 2007. ^ "University's Hall of Fame". Diamond Valley News. 21 May 2008. ^ Browne, Sophia (9 November 2007). "Crew Retreats from North". The Cairns Post. ^ a b c Irby, Ross (26 September 2007). "Battleline retreats for filming". The Cairns Post. ^ "Spielberg to Film in Queensland". The West Australian. 22 June 2007. Archived from the original on 30 August 2007. ^ Kalina, Paul (26 April 2007). "Spielberg war Epic for Docklands". The Age. Australia. Retrieved 3 April 2010. ^ Devlyn, Darren (10 November 2007). "War Comes to You Yangs". Herald Sun. Australia. ^ "Film Cast Member Breaks Leg in Freak Incident". Geelong Advertiser. 31 January 2008. ^ Idato, Michael (21 May 2007). "The View: Spielberg's Pacific". The Sydney Morning Herald. ^ Breen, Daniel (24 January 2008). "Strike Forces Early End to Filming". Geelong Advertiser. ^ Cameron, Kellie (3 February 2008). "Spielberg Declares War". Sunday Mail. ^ Byrne, Fiona (4 November 2007). "CBD's Role in Major Movie". Herald Sun. Australia. ^ Lucas, Clay (15 September 2007). "Spielberg and Hanks to stop Melbourne traffic". The Age. Australia. ^ Burke, Kelly (9 February 2008). ""Film capital" on tenterhooks as Melbourne steals show". The Age. Australia. ^ Cannata, Sarah (25 June 2008). "Baird Hitches up His Horses to Draw Movie Roles". Whittlesea Post. ^ a b c Smith, Bridie (11 December 2007). "School's Out and The Army's In, Albeit for a Very Pacific Reason". The Age. Australia. ^ Bruce-Rosser, Kate (26 March 2008). "Fight for a Skyline". Stonnington Leader. ^ Neilan, Catherine (14 December 2009). "Canongate signs The Pacific tie-in". The Bookseller. Retrieved 3 April 2010. ^ Ambrose, Hugh (March 2010). The Pacific. New York: New American Library. ISBN 978-0-451-23023-2. ^ Ambrose, Hugh (15 April 2010). "Webcast Interview". Pritzker Military Library. Archived from the original on 26 November 2012. Retrieved 25 June 2018. ^ O'Hara, Helen (23 April 2009). "Exclusive: Tom Hanks On Toy Story 3". Empire online. Retrieved 3 April 2010. ^ "The Pacific official site". HBO Asia. ^ "'The Pacific' from the Makers of Band of Brothers". Press Release. BSkyB. 21 April 2009. "Spielberg & Hanks' The Pacific Comes To Sky Movies". MOVIES:. BSkyB. Archived from the original on 25 May 2009. ^ Devlyn, Darren (April 6, 2010). Channel 7 drama, The Pacific, creates 4000 Aussie jobs. Herald Sun, 6 April 2010. ^ "The Pacific official site". WOWOW. ^ "Comcast adds exclusive HD content from 'The Pacific'". HD Report. 14 January 2010. Retrieved 14 January 2010. ^ "The Pacific: Miniseries". Rotten Tomatoes. Fandango. Retrieved 9 February 2019. ^ "The Pacific reviews". Metacritic. Retrieved 9 February 2019. ^ Poniewozik, James (9 December 2010). "The Top 10 Everything of 2010 – The Pacific". Time. Retrieved 14 December 2011. ^ Ramsey Isler (19 May 2010). "The Pacific: Series Review". IGN. Retrieved 26 April 2015. ^ "The Pacific Review". IGN. ^ 70th Annual Peabody Awards, May 2011. Franklin, Nancy (15 March 2010). "The Critics: Hell on Earth". The New Yorker. 86 (4): 68–70. Retrieved 16 January 2011. Wikimedia Commons has media related to The Pacific (miniseries). This page was last edited on 21 April 2019, at 12:14 (UTC).